The most adorable little boy won my heart the very first afternoon. He's one of the TB kids (Tuberculosis) but Robby says that he is doing 100% better than he was in August due to treatment provided by Hopegivers. His name is Fidelin. He has a habit of following adults around who will hold him because, even though he has greatly improved, much of the time he doesn't feel great. I was happy to accommodate him in my lap where he cuddled, perfectly content, for at least an hour. When I tried to put him down, he wrapped his little arms around my neck and clung to me, so I stood up and rocked him back and forth for a few minutes, at which time he fell fast asleep on my shoulder. Uhh! How could I put him down ever again? 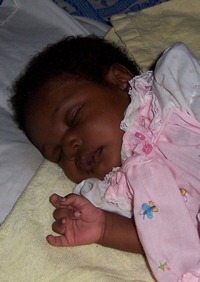 I also had a chance to see a beautiful tiny newborn girl who, along with her mother, has HIV. Willio told me that he doesn't tell the mother she has HIV because if he did, she would abandon her baby and he needs her there to feed her. In Haiti, when you get an HIV diagnosis, you are considered a "dead man walking," and the people hopelessly give up on life from that point on, even if AIDS hasn't emerged. Our team brought a plethora (love that word) of stuff for the orphanage. Medicines, toys, clothes, school supplies, books—I couldn't believe how much stuff we unloaded that first night. The kids were so excited, and many neighborhood kids hung around, hoping to get in on the goods—which they did, of course. The toys were especially fun to bring the kids for a special reason. The whole reason I ended up going on this mission came about after reading Robby Brumberg's (HGI staff) touching article about his September trip to Haiti in the Hopegivers monthly magazine. He told of how they brought toys for the orphanage, and that these were the first toys the kids had ever had in their lives. The kids were so happy to have a toy, they carried them around everywhere. One day, they took a trip to the countryside where many destitute children live in a dirty run down shack (pictured) without so much as a bed, trying to survive together. Many don't. Of the orphanage kids who went into the country to visit the homeless kids with Pastor Willio, many of them used to live in that very place before they were rescued, so they know eactly what it's like for the ones still there. One of those kids is little Fiddlin. If you're wondering why Willio doesn't bring more kids home, he has no room and no food for them. When they arrived, the orphanage kids, moved with compassion at the plight of kids who are still in the place they once were, immediately handed over their toys—their cherished first-ever toys—to the still destitute orphans. I was so moved by that story, that I contacted Robby to see if I could accompany them on a trip sometime. The next trip just happened to be scheduled just a few weeks later, and I would already be in Florida, an easy trip from there. On that first night, a fun thing happened. 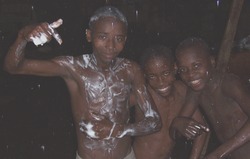 It began to rain torrentially, and all the kids used it as an opportunity to shower and use their new soap. It was so fun to watch them out playing and soaping up in the rain. In that moment, it was hard to tell them from happy American kids out doing what kids love to do…getting wet and playing in the mud. 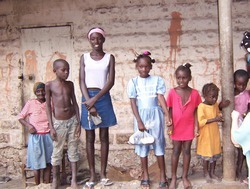 I knew without a doubt from the first day, that a piece of my heart was already being forever planted in Haiti.